In 1873 King Ludwig II of Bavaria acquired the Herreninsel as the location for his Royal Palace of Herrenchiemsee (New Palace). Modelled on Versailles, this palace was built as a "Temple of Fame" for King Louis XIV of France, whom the Bavarian monarch fervently admired. The actual building of this "Bavarian Versailles", which was begun in 1878 from plans by Georg Dollmann, was preceded by a total of 13 planning stages. When Ludwig II died in 1886 the palace was still incomplete, and sections of it were later demolished. 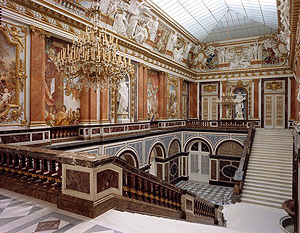 The highlights of the large state rooms are the State Staircase, the State Bedroom and the Great Hall of Mirrors. The king's own rooms were in the intimate Small Apartment, designed in the French rococo style.